[Ethernet-over-Coax Product] Dualcomm patent-pending DECA-200 PoE-over-Coax Adapter Kit is a first of its kind in the industry which includes two adapters (DECA-200A and DECA-200B), one adapter for connecting a Powered Device (PD) such as an IP camera to a Coax cable at one end and the other adapter for connecting the coax cable at the other end to a Power Source Equipment (PSE) such as a PoE enabled Ethernet switch. As such, an end-to-end PoE connection over the coax cable is established for transmission of full-duplex 10/100Base-T Ethernet data and PoE power between the PSE and the PD. 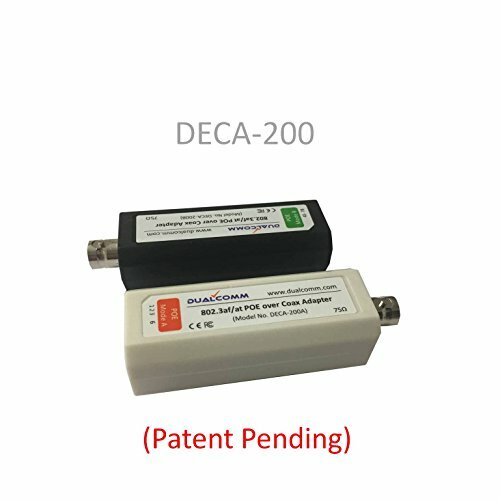 Either DECA-200A or DECA-200B can be used to connect to a PD. For connecting to a PSE, DECA-200A should be used to connect to the PSE of "Mode A" as defined in the PoE standards 802.3af/at, and DECA-200B should be used to connect to the PSE of "Mode B". The DECA-200 PoE-over-Coax Adapter Kit provides a very cost-effective way to migrate an analog video surveillance system to an IP camera video system by utilizing previously installed coax cabling. It allows you to replace analog cameras by IP cameras at your own pace as each DECA-200 PoE-over-Coax Adapter Kit can be installed independently. Transmission distance up to 600 feet (RG59)/800ft (RG6) Plug & Play and no power is required. Small size (3.1" x 1.0" x 0.9"), Light weight (1.0 oz). Patent Pending. If you have any questions about this product by Dualcomm, contact us by completing and submitting the form below. If you are looking for a specif part number, please include it with your message.